« Submission in one week! Well, this is it! Today is the day that our dossier is supposed to get submitted to the Ukraine department of adoption. It is the culmination of a huge amount of effort to present everything that they want to see. We are praying that it meets their approval! It is also exactly one year since we said goodbye to Karina, after her 3 week visit in our home. We told her then to be strong and patient, but we were sure the adoption would be completed by now. Of course, we had no idea then what would transpire with her sisters and everything else. When I visited the girls at the orphanage they showed me the one photo they still have of their mother. 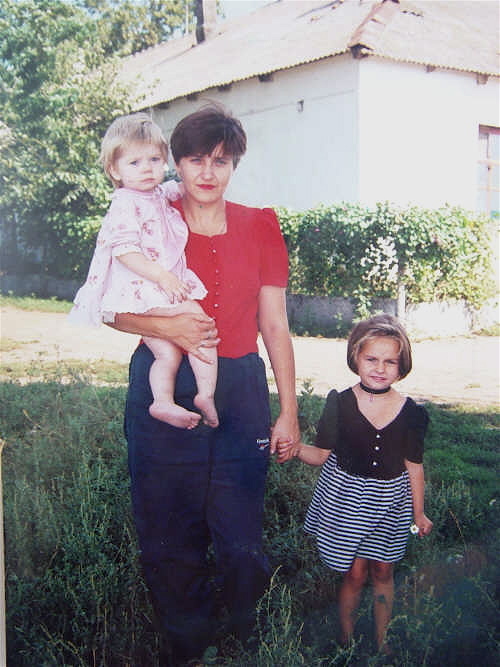 It was taken about ten years ago, and shows their mother with the two older sisters. They are standing near a typical Ukraine home. When I think about it, it’s really a miracle they still have it, after all the things they have been through. About 5 years after the picture was taken their mom went in a hospital for TB, and they never saw her again. She later passed away. I took a picture of the photo they showed me and it’s posted below. This entry was posted on August 12, 2008 at 6:33 am and is filed under Uncategorized. You can follow any responses to this entry through the RSS 2.0 feed. You can leave a response, or trackback from your own site.